Make Life “really simple” with RSS & a news reader. You’ve heard of RSS? You’ve seen those small funny tags on websites? You’ve heard co-workers and acquaintances swear by it, but still have no idea what RSS is? Well don’t worry, you’re still in the majority, but this is changing rapidly. In the information world, RSS is not only revolutionalizing the way news, media and content creators share information, but it also is swiftly changing the way everyday users are consuming information. RSS stands for “Really Simple Syndication” and is a file format for delivering regularly updated information over the web. Just think about the websites and news information sources you visit everyday. It takes time to visit those sites and scour the ad-filled and image-heavy pages for just the text you want to read, doesn’t it? Read more about RSS here. Now imagine if you could visit all those information sources and web pages in just one place and all at the same time … without being bombarded with advertising… without having to search for new information on the page you’d already seen or read before… and without having to consume a lot of time visiting each site individually. Would that be valuable to you? Well, it’s available now through a newsreader and RSS. This week’s discovery exercises focus on learning about RSS news feeds and what free tools you can use to do this. Follow these discovery exercises to set up your own, personalized RSS feed reader. 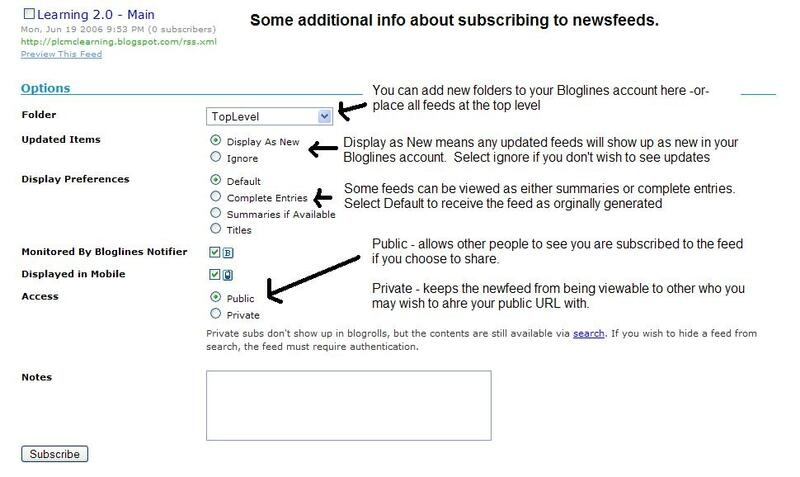 Learn about the differences between RSS feed readers, Bloglines, and Google Reader. Create a post in your blog about this exercise. Don’t know what to blog about? Think about these questions: What do you like about RSS and newsreaders? How do you think you might be able to use this technology in your school or personal life? How can libraries use RSS or take advantage of this new technology? CNET Video: RSS – Feel the Need for Feeds (3:32) – a good over view of what RSS is and the benefits to users. What is RSS? Video by Common Craft. And other similar videos. How to Make your RSS Feeds Pop! Check your local newspaper and discover if they have an RSS feed you can subscribe to. Your co-workers or fellow Classroom Learning 2.0 participants - tap into their knowledge and experience with RSS feeds and readers. 2. Scroll down the right screen pane and locate the public URL. Why have a public account? To share blog rolls with others, of course. That's how we keep track of Classroom Learning 2.0 participants. It has been a fantastic productivity tool for the CSLA 2.0 Team project manager -- each time a participant posts something new to their blog, our bloglines list shows their blog in BOLD and how many new posts have been added to their blog since the last time we looked. NOW, imagine that you have one or more classrooms full of students who each have a blog and must post an assignment to their blog -- you can see at a glance which students have posted. Idea #1: Use an RSS Reader to keep up to date on issues of interest to you. Idea #2: Locate news items on a particular theme, copy them – or create links to them onto your classroom blog. Have students read them and then create your chosen activity: class discussion, critique, review, debate or perhaps writing onto a class wiki.